I must say that at first I didn't know where this was, but I had a feeling it would be somewhere along the route I walk several times a week. And I was right. 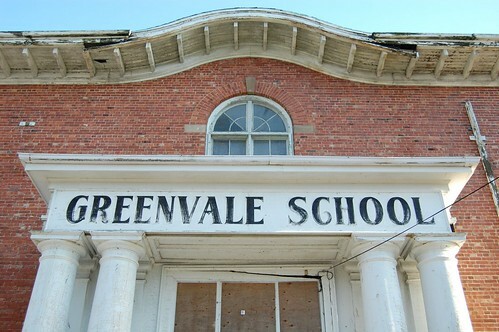 Behold the lovely and disheveled Greenvale School. Evidently this school is going on 100 years old, and some of the majestic trees didn't make it through Hurricane Juan in 2001, but the structure still stands (and will likely be condos sometime in the future, which I suppose is better than seeing it fall.) 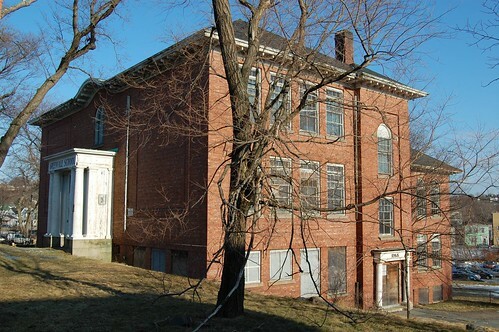 It would have been nice to see the inside of this place, now or sometime in the past, but neither is possible. Boards and chicken wire effectively keep out trespassers and photographers alike! Thanks to Steph for the latest challenge... I'll now be on the lookout for the next great spot. Oh, and every time I walk by this place, I always think of this. Nice job, Mike. I love the Midvale "School for the Gifted" reference. That's one of my favourite of G. L.'s. I love that old building. It's a shame to see it sitting there, empty. Mr. Happy and I think that we will win the lottery, buy it and turn it into some sort of cultural centre for downtown Dartmouth. 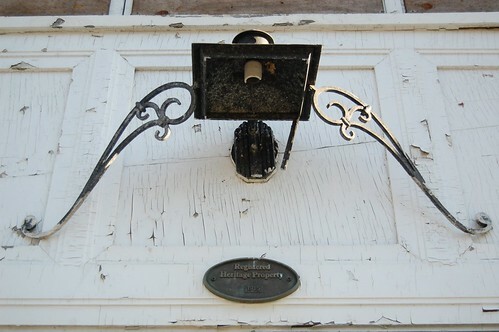 Yes, culture and Dartmouth CAN go together. I agree, I think the building is beautiful and has so much character and wonderful history. It would be a great history museum or culture center as you said, a gallery of some time. The huge windows would be really nice in an art studio.